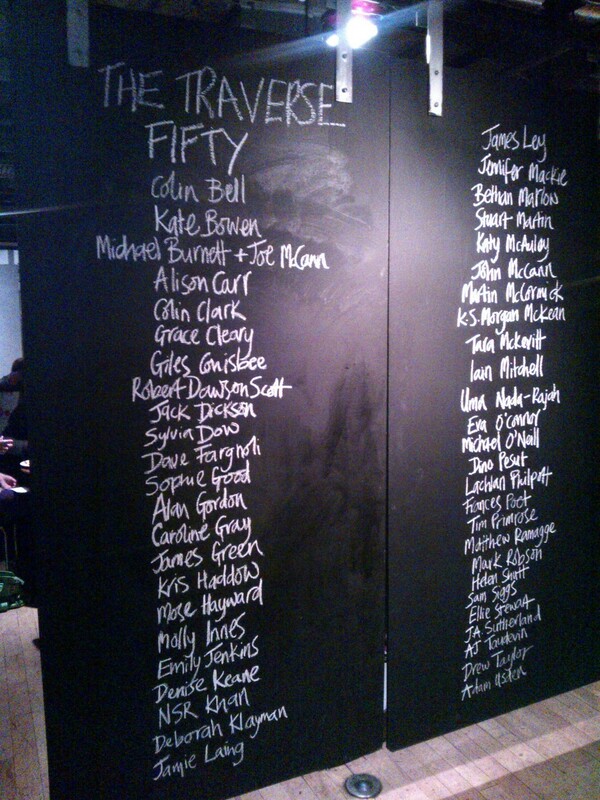 In 2013 Edinburgh’s Traverse Theatre is 50. Happy birthday, many happy returns, etc. The call went out far and wide, with over 630 writers applying with their 500 word ‘Plays for Edinburgh’. I’m delighted to be amongst the Traverse 50 writers whom the Theatre have commissioned to develop full-length plays, headed for performance in 2014. Click [here] for an article in The Herald. I deliver my Headset Play Noise and Hidden Play You Too? Noise and its pitch differ quite substantially, but as I was writing it it became something else. And I know You Too? is a terrible title – it sounds like a kids TV programme – but I panicked, ok.
We are invited to pitch Headset Plays and Hidden Plays for the Autumn Festival. The Headset Plays are five-minute shorts that audience members listen to on individual headsets in different parts of the building. The Hidden Plays are tiny bursts of theatre that will be scattered about the building. I pitch for both. Gotta be in it to win it! The Fifty Plays for Edinburgh return to the Traverse, split over two nights this time so it’s less of a theatrical marathon! I am delighted that my short Fat Alice has been selected to be part of the Autumn Festival, to be performed as a rehearsed reading directed by Zinnie Harris. I’ve got a month to deliver the re-write based on my feedback session, let’s hope it doesn’t go all “mashed potato” on me. I head up to Edinburgh for a meeting with Zinnie Harris about the play I submitted for the Autumn Festival. It’s a short play and a short meeting, but it’s not every day you get the chance to have 1-1 feedback with a writer of Zinnie’s calibre and experience, and getting the most out of the opportunity is what this year is all about. My play opens with the downstairs neighbours. We then leave them and go upstairs to the action. Zinnie suggests a re-write that involves telling the whole story from the downstairs neighbour’s perspective. I am unsure if I want to. I am unsure if I can. She says it “might all go to mashed potato” but to try it. The Traverse announce their line-up for the 2013 Edinburgh Festival Fringe, including another outing for the 50 Plays for Edinburgh. A 2-day workshop this month. Day #1 spent with writer Tim Price dissecting various well known films and talking about structure. Thanks to a landslide = bus replacement service for part of my journey I was regrettably late, so all of the prep we had been tasked with – WHICH I DID – was wasted as that bit of the session was over by the time I got there. Fuming. I got a bit of an attitude on, thinking ‘yes, yes, I know about structure’, but once back in my B&B I actually sat down and applied Tim’s ideas and methods to a pitch I was working on. Lo and behold, it improved it no end. Turns out I don’t know everything. Who’d have thunk. Day #2 spent with Zinnie Harris who ran an imagery workshop. Right up my street and even though she didn’t like my ‘what happens next in the suitcase story’ idea (sob) it was really interesting and got some ideas sparking. We’ve all be paired up with our photographers. Your photographers? I hear you cry. Yes indeed. Writer Pictures, who specialise in literary portraits, are collaborating with the Trav50 to produce portraits of each of the writers and they’ll be displayed later in the year. ‘My’ chap is a very talented documentary photographer called Ian Forsyth. I opened my introductory email to him with the words “I hate getting my photo taken” … we’re yet to meet but plans are afoot and I just hope he doesn’t end up feeling he pulled the shortest of short straws. The whole thing kicked off with our first get together (it had a very first-day-of-school vibe about it and there were name badges). This was followed by the not inconsiderable task of staging all 50 tiny plays to ‘introduce’ us and the project to the wider-world. Clearly the ‘wider-world’ were interested to have a look as the original one-nigher had to be extended to two to meet demand.